Hello everybody, I posted this thread because I am in a sociology class researching the Northland area about social problems ( meaning, problems in the neighborhoods, crimes, about schools, and shopping areas.) As a community, I would like to hear about your options about what big problems should be address that is affecting Northland a lot. In addition, tell me how we should fix them and what is causing them.Just pretty much anything that comes to mind. Last, if you guys know anyone I should interview about Northland and could answer more about my questions please post or message me with their contact info. Thank you very much guys for reading this and hopefully I will get some great responses. I would discuss how the combination of LBJ's social welfare programs and inexpensive crack cocaine has enslaved Black Americans again. These two events increased the % of children raised in a fatherless household.....and voila....you have Northland. I dont think the Northland area is the poster child for LBJ's policies. Driving Park maybe, but Northland not so much. To the original posters question I did not live in the Northland area but went to High School for a time out there and the area has changed since the 90's due to urban sprawl. I still view Northland as a solid blue collar,middle class side of town but again I haven't lived out that way. I can say that a lot of black families started to buy homes in and around the area in the late 80's and 90's but most of the problems in the area come from economic sprawl that effected everyone. I knew things changed when they closed Brookhaven High School. It was over crowded back in the late 90's. Like a lot of other places around the country Northland was a middle class suburb when it was first developed back in the 60's and became " inner city " starting around the early 80's. 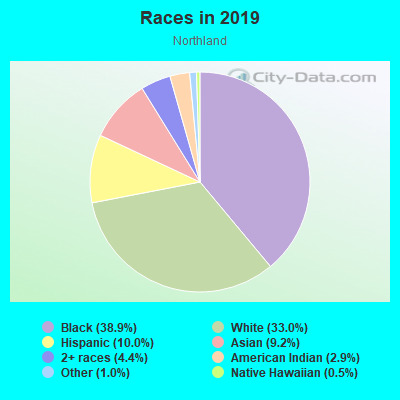 Northland is mostly black? Must be perception.